Aurangabad: Resident doctors at Government Medical College and Hospital (GMCH) at Aurangabad today stopped working after one of the doctors was allegedly manhandled by a group of people accompanying a patient. There was no announcement of a ‘strike’ though, said one of the resident doctors, speaking on the condition of anonymity. A group of around 40 persons came with a patient who had a liver ailment early morning today, he said. 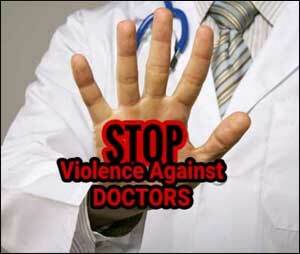 When a doctor on duty asked them not to enter the emergency ward, they allegedly abused him and roughed him up. When other resident doctors learnt about the episode, they demanded the hospital management file a police complaint and decided to stop work till then, he said. Patients coming from various parts of Marathwada had a hard time as no doctors were available. The dean and the superintendent of GMCH were not available for comment. when so many people gather around serious patient if pt. dies,can we say that relatives didnt allow me to treat pt by creating obstacles to reach to pt and by asking so many questions about pt\’condition. can we file a case against relatives.